Sunrise Park’s renovation remains a work in progress. It looked like this on Thursday. The renovation is nearing completion, but it’s taking a bit longer than expected. In March the city awarded a $259,500 contract for the construction work involved. 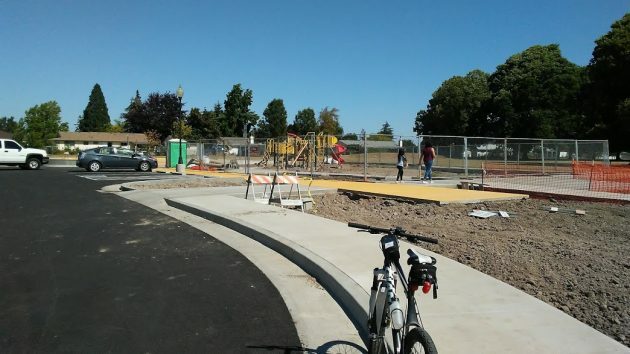 That job appears essentially done, and parks maintenance has been installing the playground equipment. The parks department expects delivery of a shelter in August. Landscaping and irrigation won’t be finished till the end of summer, when cooler weather should help new plants survive. 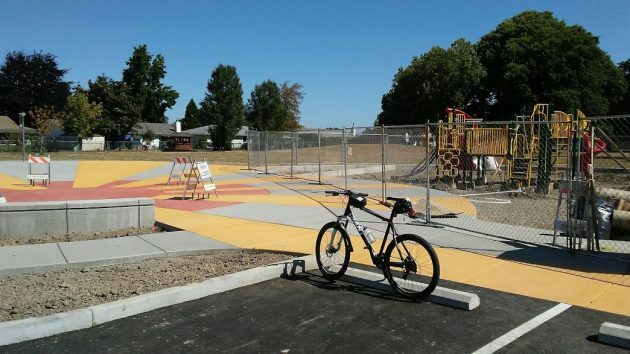 “However,” Parks and Recreation Director Ed Hodney told me when I asked, “we will open the new playground and the rest of the park to public use with a ‘sneak peek’ during a National Night Out event on Aug. 7.” Then, he says, a formal dedication will be held after school starts in the fall. This caused delays while the city had to obtain a “wetland removal and fill permit.” And the city had to send $38,000 out of the project budget to buy mitigation credits in a Eugene “wetlands bank.” This for a fully developed city park that had no connection with fisheries, navigation, water sports or the environment — the things that protection of real wetlands is supposed to enhance. A shelter will be installed over the orange concrete toward the left side of this frame. The Albany General Hospital Foundation had to also buy wetland credits when the Evergreeny Hospice House was built six years ago. The facility is just west of the park. The money for the credits, and the entire project, was donated from generous donations. Hasso, you are a classic Republican in some ways with the overlay of libertarianism. Wetlands are good for the environment and all sorts of little creatures such as frogs, for instance. Wetlands are good for the atmosphere and the groundwater and your grandchildren’s future. If we had no rules or laws, man would ruin everything just for profit and greed. Frogs in the bark mulch under the old swings at Sunrise Park? I kind of doubt it. The entire wetlands thing is a farce. Among the many things used to classify “wetlands” is soil type. How can one move from a parcel that has the designated type of soil to another parcel with a different soil type and say it is “Wetlands”. I know of one parcel that has been filled with what was excavated for the N Albany sewer project. When they city came in to do their wetlands survey the expected meandering line designating wetlands reaches this parcel then runs in a straight line. Hasso, Thanks for keeping us so well informed. You are truly a great asset to the community. I am a frequenter of Sunrise Park as I have lived in this area of town for the past six years. I understand the thinking that wetlands are just areas that contain water, but this park every fall-early spring floods over with large pools (where the parking lot is now) where you can find ducks and in the early spring tadpoles. While it may not look like a wetland habitat in the summer it does contain habitat for multiple species through out the year. I am excited for the new park and hope that my community will feel safe to come to the park. Thank you for this helpful added perspective.